A variety of spinal problems can produce symptoms that indicate a lumbar laminectomy may be an appropriate therapy. Spinal stenosis of the lower back is one of the most common of these problems. Lumbar spinal stenosis is characterized by an abnormal narrowing of the spinal canal, which can put pressure on nerves and nerve roots emanating from the spinal column. Symptoms of back problems appropriate for lumbar laminectomy surgery can include low back pain, leg numbness and tingling sensations, and pain in the legs while walking, called claudication. The longer an affected individual stands or walks, the worse the pain in the legs becomes. The spinal claudication usually subsides with rest, but affected individuals must often stop for a few minutes when walking to allow the pain to dissipate. Pain that is relieved when flexing forward or sitting is also an indication of spinal stenosis. 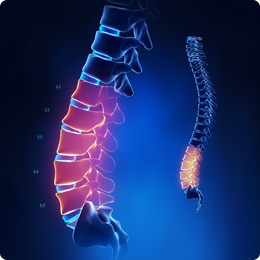 The good news is that there is a new surgical treatment proven to have better outcomes over spine fusion surgery for individuals with moderate to severe spinal stenosis symptoms. The TOPS™ System is designed to stabilize but not fuse the affected vertebral level following spinal decompression surgery performed to alleviate pain stemming from degenerative spondylolisthesis and/or spinal stenosis. The procedure provides immediate and sustained improvement in quality of life. With the TOPS System, clinicians can remove all elements pressing on nerve roots without concern for leaving enough bone for fusion to occur. Instead of permanently locking two adjacent vertebrae, clinicians allow the two vertebrae to continue moving normally with the assistance of the TOPS implant. The TOPS System allows full range of motion at the operative level, while prohibiting excessive twists and turns. The result is optimum decompression, motion preservation, spine stability, and pain relief. Patients typically experience immediate pain relief post-surgery. As there is no fusion taking place in the lower back with the TOPS Posterior Arthroplasty procedure, there are few restrictions on activity. Most patients are on their feet and walking the next day, and claim they haven't felt so pain-free in years. If you have symptoms of spinal stenosis, talk to your doctor about all your treatment options, and find out if Posterior Arthroplasty is the right solution for you. Not available for use or sale in the United States. Premia Spine products are CE approved.